Providing you the best range of electrodeionization (edi) with effective & timely delivery. We are a leading and well recognized names in the field of providing solutions for Electrodeionization (EDI). 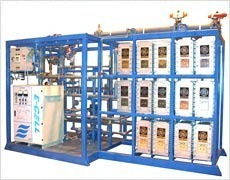 It’s a water treatment technology which utilizes electrodes for ionizing water molecules as well as separating dissolved ions (impurities) from water. As a technology, EDI combines ion exchange resins and ion-selective membranes with direct current which assist in effective removal of ionized species from water. Further, EDI process helps in producing industrial process water of high purity by using less than 95% of chemical products that are used in conventional ion exchange processes. The other advantage of the system is that EDI system membranes and electricity effectively replace acid and caustic chemicals that were used in old processes for water treatment.